November is here and excitement is filling my heart and soul for all the amazing opportunities and adventures that lay before me. Tomorrow morning, Don and I leave with 16 lovely souls for our Cuba Yoga & Meditation retreat. We are so excited to share space in this beautiful country once more and to feel the warm sun on our skin and sand between our toes! Then, the day after we bring the group back to Canada, we take off again to go to Belize, the country where we are planning to set up a home base for future winters to come. If you would have told me 10 years ago that I would be an entrepreneur with a successful holistic business, I would have laughed in your face. I was not in a good place then to even see what 10 years out could look like, so no way would I have believed that pipe dreams and deep yearnings for a better life could even happen. But then a life changing moment happened and everything changed. Now, for the past 7 years, I have worked hard to build my business and work on myself, mind, body and soul. It takes a whole lot of personal development to be able to change the rigid mindset that gets installed as we grow up. I had to learn how to dream big, not get lost in the how and keep working towards the goal. In our society, there are those who believe that stability comes from working a job we hate because it pays the bills. Where going into debt to have a big fancy house and new cars is completely normal. Where being an entrepreneur is risky and a bad choice when raising a family. I had to really fight against those old debilitating beliefs and had to create and BELIEV in new ones. I began building a life that I wanted to live for myself, for Don and especially for our 2 amazing kids. To show them that they too can do anything they want as long as they are willing to put in the effort and time. I want you to know that, yes, dreams do come true if you are willing and open to work for them at all levels. Do you have a dream? What are you willing to do to achieve that dream? Can I support you in any way? I am always here to offer guidance…I am just a text, email or Facebook message away! May you all have a happy and blessed November! And, I will do my best to bring back some sunshine! 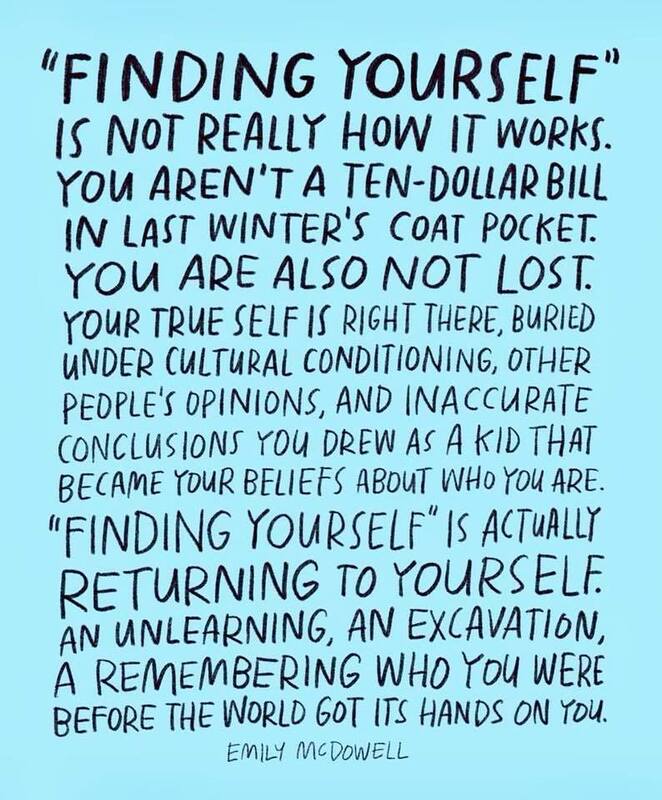 A return to oneself…I love this…I have been actively working on this for the past couple of years. It has been a slow and mindful practice as it took over 40 years to create the turmoil within. I have been slowly dismantling the expectations, ideas and limitations that others have placed on me so that I may unfurl into the perfect bloom that I am. This takes time as change, even good change, can be scary and the ego mind doesn’t like it much. However, it is possible…I am living proof! I did at one time feel lost, very small and very ineffective in supporting others and especially myself. I felt like a failure due to not meeting the expectations of others or playing the vicious comparison game with myself always falling short. In fact, once I was diagnosed with Fibromyalgia, I even had people in my life, close people, tell me it is all in my head, or that I was not doing something right and that it was my fault. Sadly, I believed them for a while and it pushed me into the depths of depression…I knew then that changes were needed and they were needed asap. So I I removed toxic relationships and experiences out of my life. This was not easy and still to this day, I am sure there are people unaware that I even did this. I regained my confidence to be unabashedly me and I stepped into my power to support myself and others on a whole new level, a level that I am so proud of and humbled to be able to do. Today, I find myself happy with who I am and how I show up in the world. I still have work to do as we are all “Works in Progress” and the work will never be done as it is truly a journey to the soul. With life experiences and people impacting our thoughts, our bodies and so our lives, it is ok to be on a continued remodel as one navigates what works and what doesn’t. The beauty of this is that we get to figure this out and then decide what is the best path for us….and we can change our minds. I know I have angered and frustrated people and I am sorry for that as I never intend to purposely hurt anyone. From my studies of the 4 Agreements, I realized that their pain, discomfort and/or anger is actually not about me, and in fact, it is all about themselves. Some people use and or manipulate (intentionally and unintentionally) others as a way of making themselves feel better about who they are. To them I send love and hope that they see that the only person they need to put effort into is themselves. Happiness always comes from within, never external sources. 07 Oct 2018 Comments Off on Happy Thanksgiving! Canadian Thanksgiving weekend is here. Yesterday, today and tomorrow many people will gather with family and friends over lovingly cooked meals to celebrate Thanksgiving. This is a time of year that we express gratitude for what Mother Earth has provided from the harvests and for those who touch our lives. It is during this time of year that I take time to really see all the blessings in my life. All the people, opportunities, possibilities and experiences that I am so grateful for. For all the unconditional love and support that has been given to me in so many ways but especially when I struggle with depression, chronic pain and the constant battle with my Fibromyalgia. For those who support my Holistic Business, who attend my classes, workshops, retreats and purchase my essential oil. I am humbled by the kindness and generosity I receive from others. I also take time to tell those who are so important to me how much I love and appreciate them; Without them, I would not be the woman I am today; a woman I am proud to be, flaws and all and a constant work in progress. These amazing Earth Angels have helped shape me by providing opportunities to learn invaluable lessons of love, forgiveness, respect, and compassion for myself and others. If you are reading this post, please know that you are one of the many Earth Angels I am so dearly blessed with and grateful for. You make my world better. Your light, your energy and your spirit are so needed in this world. Don’t be afraid to shine bright and if you need and support in doing so, please don’t hesitate to ask. 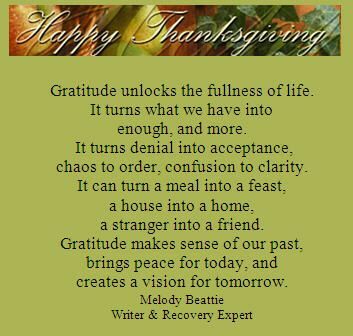 We all have so much to be grateful for today and always. From my family to yours, Happy Thanks giving! Wow! I can’t believe Summer went by so fast and Fall is approaching so quickly!! The leaves are turning, the animals preparing for Winter, we have had our first frost warning out here on the acreage and last night we had a beautiful fire to warm up the house. I have a love hate relationship with Fall. I love the beauty that unfolds before me; I love the harvest of all the organic veggies from our garden; I love the coziness of warmer clothes; I love Pumpkin Spice Lattes; I love soup; I love the opportunity to withdraw a bit to read a book, do some personal development or watch a movie under the blanket with a cup of tea; There are so many things I love and am grateful for them all! The one thing I dislike a lot, is the cooler weather and the pressure changes that makes my body hurt so bad; My Fibromyalgia always act up as the days begin to cool off and the knowing that Winter comes after Fall creates a shift in me that wants to hide under my heated blanket and wait it out until Spring. But that is not practical nor a positive action and I don’t think Don would appreciate it at all. I have to remind myself that I am a Fibro Warrior and I have many ways to support my body, mind and soul to support me through the dark, cold days. I have learned to embrace my limitations and shift my focus to positive thinking instead. I have figured out how to effectively grow my heart centred business by being there and supporting others to the best of my ability, while still practicing deep self care and self love. Over the next 2 months, I have stacked my schedule with a variety of classes, workshops and retreats to support your journey on the physical, mental and emotional levels. I hope you can take advantage of some of the offerings. You are so important to your family, friends and to the world! You deserve to be happy, loved, supported and living your best life. If I can support you in any way, please let me know! Have a happy and blessed September! For the past couple of months, I have worked on letting go of expectations, fear, judgements, old beliefs and relationships that no longer serve me. I also worked on clearing my space and my mind of old paradigms, thoughts and stuff. I know something has shifted and that this is all working, as my life has a lighter more peaceful experience to it and is drama free! All this work has helped me figure out who I am, what I want (and don’t want), where I want to go and how I want to show up in this amazing world. I have realized that for a long time, I have done things and acted a certain way to please other people. I allowed other people’s stories and dramas to dictate my life and how I showed up in it. I now see many time where patterns, knee-jerk reactions and ignoring gut instincts happened and caused me personal distress. I would put on the appropriate mask and act a particular way to not make other people feel uncomfortable at the expense of my own feelings and opinions. I was not the authentic me and that really bothers me. Not cool! This summer, I am making the conscious and sometimes challenging choice to not people please. It is way harder than I thought as I have already had opportunity to practice this. Don’t get me wrong, I am not saying that I am no longer going to support and be there for people. I couldn’t stop that even if I tried; it’s wired in my DNA to be there for others. What I am saying is that I am only going to show up and be there for people when I know I can be the 100%, authentic me and if that bothers people, I have to let that go (and maybe even them). I can’t be everything to everybody and I have learned, that no matter how hard I try, I can’t please everybody. I will be going to bed each night proud of what I accomplished that day and how I showed up to serve. That feels good just typing it out and now you are all my witness to this agreement with self. How are you showing up in your life? Shoot me a message or email; I would love to hear from you! I finished another AMAZING book and had to share it with you! My review will also be in the Yoga For Today newsletter again this month. I do hope you get an opportunity to read this one soon. 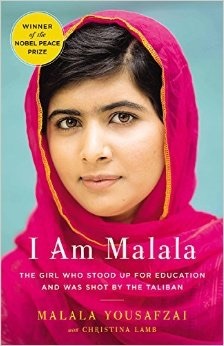 I had been drawn to the remarkable courage of Malala even before I read her book. I followed her on Facebook and read everything I could that was written about her. I was in awe of this very young Pashtun women from Pakistan’s Swat Valley and couldn’t even imagine what it was like to have experienced what she alread did at such a young age. The book began where Malala’s world changed forever…One October day, when she was just 15 years old, a young boy trained by the Taliban, got on her bus, shouted “Who is Malala”, and then shot her point blank in the head. Her survival is a miracle and due to some quick thinking individuals and the Universe knowing she still had much to do, she was rushed out of the country to England, her parents and siblings joining her at a later date, where she was able to make a miraculous recovery and continue her work. Malala’s mother was illiterate as many Pashtun women are; Malala’s father, on the other hand, was an educated and very intelligent man who did not always follow traditional rules. He often spoke up against the wrongs that he witnessed and ran a school where both boys and girls of any age were taught. He raised Malala as if she were a first born son and gave her all the tools she would need: support, education, self confidence, and a platform to voice her thoughts and opinions. Together, father and daughter changed the world and continue to do so. They brought to light the importance of educating every child on the planet and have even set challenges to the first world countries. Her drive and determination is powerful, she inspires me to continue my journey and I hope she will move and inspire you as well. Happy reading and let me know what you think! It was Spring of 2013, I wanted to give back to the community in some way as part of my personal karma yoga practice and had just discovered an amazing program down in California that had yoga being taught successfully to the male prisoners in the San Quentin prison. Looking more into this program, I just knew that this is what I needed to do, and as fate would have it, it was around this time that I met Joe Sheen, the program’s director at the Fort Saskatchewan Corrections Center(FSCC). It is with his assistance, support, determination and hard work that this program began. He sought out the funding and space, provided me with an orientation and tour and got everything in place to make sure the program runs smoothly. The FSCC Yoga Program officially began January 2014, and I can still remember the very first class and how extremely nervous and unsure I felt. I was escorted into the facility by Joe and introduced to the recreation staff, who have been and continue to be, an amazing support to both myself and the program, and I am thankful for all of them. When the first group entered, my plan was to be nice and it would all be ok…or so I thought…I soon discovered the need for very clear boundaries and that I couldn’t be a pushover, I needed to be firm. Those first few weeks were very interesting as I could get a group that was very respectful and open and the class would flow smoothly and on another week, the complete opposite, where there were disruptive individuals who I had to send back to the unit and the class felt like it would never end. The recreation crew and I would work together and through trial and error, we began to figured out how we could offer a good experience to those who wanted it and I learned how to be tough but still kind and compassionate. Fast forward 18 months…The women enter the gym one at a time in a haphazard line and quickly make their way to a favorite colored mat or to a spot in the front or back depending on preference. Each week new faces are among the familiar, and there is an understanding of what to do and not to do. A quick introduction, an explanation of the rules and we begin. They settle on their mats, preparing for the practice. The next hour is theirs, to forget where they are, to move their bodies mindfully, to breathe and to begin or continue the process of self love, acceptance and forgiveness. Every class begins with relaxing the body, a short meditation and some breathing exercises, followed by some warm-ups. The class is them dictated by first taking into account that the women have just eaten dinner, then the mood and energy of the class and the behaviors that are showing up. I teach to the group in front of me, most weeks, the class moves seamlessly along as the women move together, breathe together and heal together. As the class comes to an end, the women are given a few minutes of stillness, silence and peace before wiping their mats down and heading back to their respective unit. Sometimes after a class, someone will come up to me and thank me, share a personal story or ask how they can continue practicing once they get out. It is these moments that my heart fills with joy and my belief that yoga can make a difference is reinforced. It is why I keep coming back. 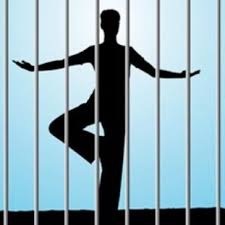 I have often been asked why I teach yoga to the inmates and my answer is simple, because they need it. There is 100% guarantee that the women who attend my class will return to their communities and if the yoga program can make a difference for even one woman to help her make healthier choices to breathe deeper, to slow down,to be more mindful and present and to love themselves, then, to me, it is a very successful program. We must all, as Gandhi once said, “Be the change we want to see in the word”. I truly believe this and the yoga program at the Fort Saskatchewan Corrections Center is one of the ways I can be that change and for that I am deeply grateful for the opportunity.